photograph courtesy Janae’ Reneaud Field. 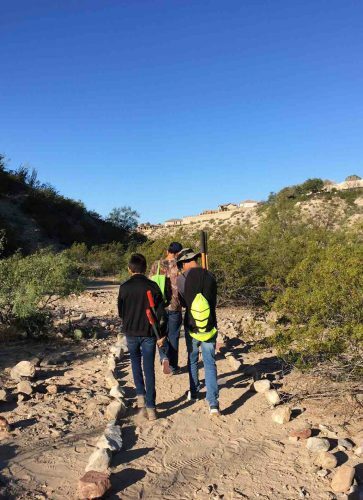 An Boy Scout troop recently made trail improvements at the Wakeem/ Teschner Nature Preserve, a 96-acre portion of El Paso’s Resler Canyon, owned by the Frontera Land Alliance. No part of that “wonderful country” has changed as dramatically as El Paso. From a valley of farms and Spanish missions, its metropolitan area now has a million people. But undeveloped mountains, thorny arroyos and agricultural rhythms remain. The Frontera Land Alliance, an El Paso nonprofit, is working to preserve those pockets of open space. On El Paso’s west side, the Wakeem/ Teschner Nature Preserve contains 91 acres of rugged Resler Canyon. It’s surrounded by dense commercial and residential development. But stepping into the preserve, the urban pace subsides. Scrub jays, flickers and Gambel’s quail dart amidst desert willows. Ocotillo and prickly pear cling to the canyon’s rim. Visitors might see a mule deer, coyote or fox. Resler Canyon is a longtime community resource – over decades, hikers have worn a trail into the canyon bottom. But in the early 2000s, a developer planned to build 320 homes at the site, and to fill in the arroyo. The newly formed Frontera Land Alliance – with the support of a UTEP professor named Dr. Richard Teschner – intervened. Teschner offered to use a family inheritance to “save the canyon.” With his donation, Frontera purchased the land. Scott Cutler is Frontera’s board president. He says places like Resler are critical for quality of life. In Franklin Mountains State Park, El Paso has the nation’s largest urban park. But preserves like Resler make the natural world accessible. A Boy Scout troop recently made trail improvements. Volunteers have created habitat for burrowing owls. Frontera leads guided hikes. Janae’ Reneaud Field is the nonprofit’s executive director. In 2007, Frontera partnered in another project on El Paso’s west side – at Thunder Canyon. Though it was slated for development, surrounding homeowners wanted to preserve the 26-acre arroyo as open space. In a creative arrangement, the City of El Paso purchased the land, and the adjacent landowners agreed to tax themselves to reimburse the city. Frontera assumed a “conservation easement” on the property. Frontera is responsible for monitoring and defending conservation of the land. Like Resler, Thunder Canyon is open to the public. Farming and ranching are at the root of El Paso’s history. But as the city grows, farmers and ranchers are pressured to sell for urban development. Frontera works with landowners – from El Paso to Culberson County – to establish conservation easements. Under easements, some part of a property can be sold for development, and agricultural activities can continue, but the bulk is preserved from subdivision in perpetuity. Cutler said that Frontera is contributing to a cultural change in Texas’ only mountain city. The organization can be a model for other cities watching with dismay as open spaces vanish.